A platformer game needs platforms. In Pygame, the platforms themselves are sprites, just like your playable sprite. That's important because having platforms that are objects makes it a lot easier for your player sprite to interact with them. There are two major steps in creating platforms. First, you must code the objects, and then you must map out where you want the objects to appear. To build a platform object, you create a class called Platform. It's a sprite, just like your Player sprite, with many of the same properties. Your Platform class needs to know a lot of information about what kind of platform you want, where it should appear in the game world, and what image it should contain. A lot of that information might not even exist yet, depending on how much you have planned out your game, but that's all right. Just as you didn't tell your Player sprite how fast to move until the end of the Movement article, you don't have to tell Platform everything upfront. When called, this class creates an object onscreen in some X and Y location, with some width and height, using some image file for texture. It's very similar to how players or enemies are drawn onscreen. The next step is to map out where all your platforms need to appear. There are a few different ways to implement a platform game world. In the original side-scroller games, such as Mario Super Bros. and Sonic the Hedgehog, the technique was to use "tiles," meaning that there were a few blocks to represent the ground and various platforms, and these blocks were used and reused to make a level. You have only eight or 12 different kinds of blocks, and you line them up onscreen to create the ground, floating platforms, and whatever else your game needs. Some people find this the easier way to make a game since you just have to make (or download) a small set of level assets to create many different levels. The code, however, requires a little more math. SuperTux, a tile-based video game. Another method is to make each and every asset as one whole image. If you enjoy creating assets for your game world, this is a great excuse to spend time in a graphics application, building each and every part of your game world. This method requires less math, because all the platforms are whole, complete objects, and you tell Python where to place them onscreen. Each method has advantages and disadvantages, and the code you must use is slightly different depending on the method you choose. I'll cover both so you can use one or the other, or even a mix of both, in your project. Mapping out your game world is a vital part of level design and game programming in general. It does involve math, but nothing too difficult, and Python is good at math so it can help some. You might find it helpful to design on paper first. 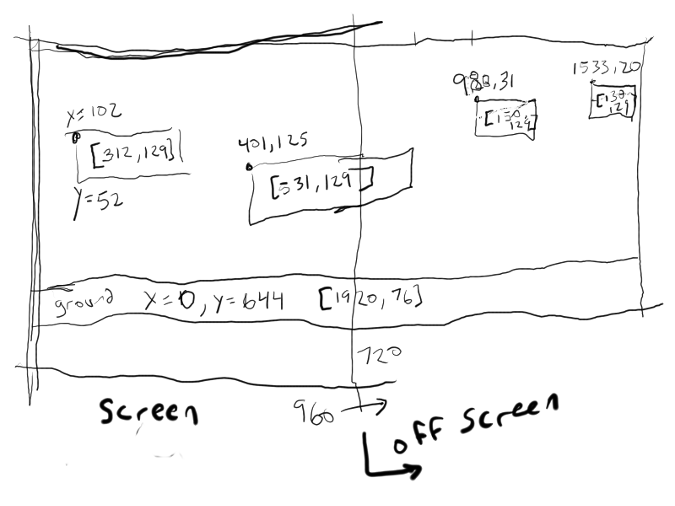 Get a sheet of paper and draw a box to represent your game window. Draw platforms in the box, labeling each with its X and Y coordinates, as well as its intended width and height. The actual positions in the box don't have to be exact, as long as you keep the numbers realistic. For instance, if your screen is 720 pixels wide, then you can't fit eight platforms at 100 pixels each all on one screen. Of course, not all platforms in your game have to fit in one screen-sized box, because your game will scroll as your player walks through it. So keep drawing your game world to the right of the first screen until the end of the level. If you prefer a little more precision, you can use graph paper. This is especially helpful when designing a game with tiles because each grid square can represent one tile. Example of a level map. You may have learned in school about the Cartesian coordinate system. 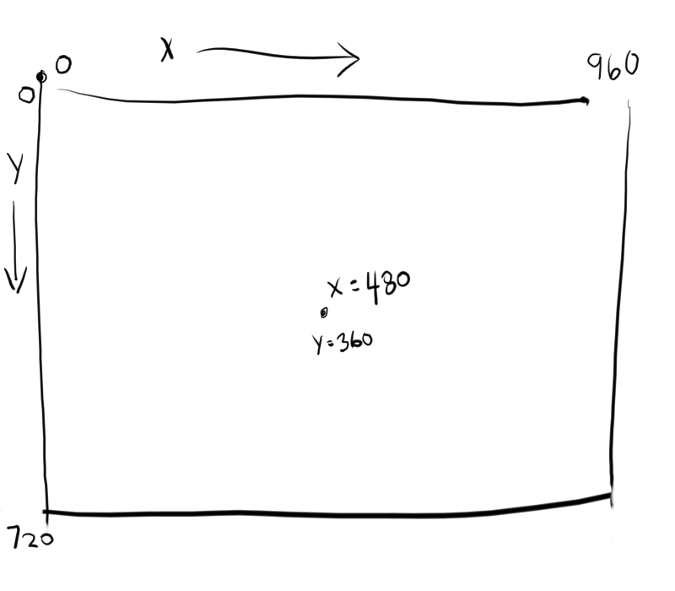 What you learned applies to Pygame, except that in Pygame, your game world's coordinates place 0,0 in the top-left corner of your screen instead of in the middle, which is probably what you're used to from Geometry class. Example of coordinates in Pygame. The X axis starts at 0 on the far left and increases infinitely to the right. The Y axis starts at 0 at the top of the screen and extends down. Mapping out a game world is meaningless if you don't know how big your players, enemies, and platforms are. You can find the dimensions of your platforms or tiles in a graphics program. In Krita, for example, click on the Image menu and select Properties. You can find the dimensions at the very top of the Properties window. Save the text file as identify.py. The image size of the ground platform in this example is 1080 pixels wide and 97 high. One image file per object. Your level cannot be one image file. 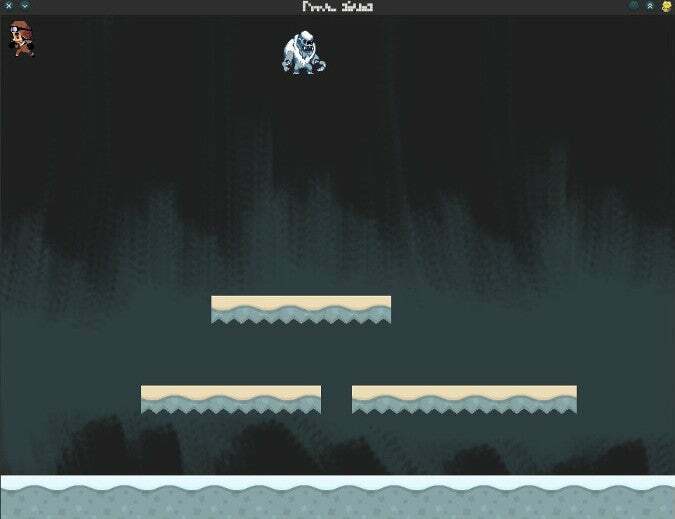 You might want your game to look like that when you've finished, but if you create your level in one big file, there is no way to distinguish a platform from the background, so either paint your objects in their own file or crop them from a large file and save individual copies. Note: As with your other assets, you can use GIMP, Krita, MyPaint, or Inkscape to create your game assets. 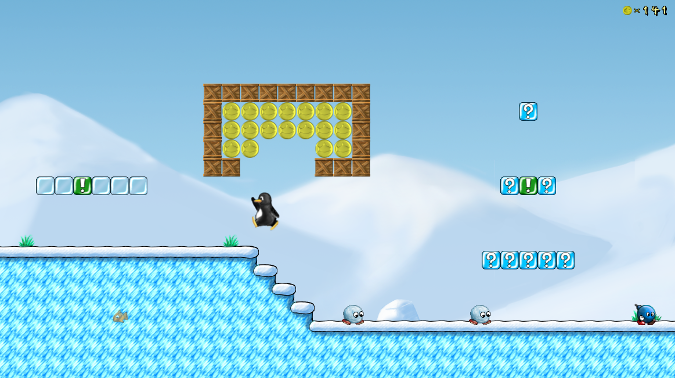 Platforms appear on the screen at the start of each level, so you must add a platform function in your Level class. The special case here is the ground platform, which is important enough to be treated as its own platform group. By treating the ground as its own special kind of platform, you can choose whether it scrolls or whether it stands still while other platforms float over the top of it. It's up to you. The ground function requires an X and Y location so Pygame knows where to place the ground platform. 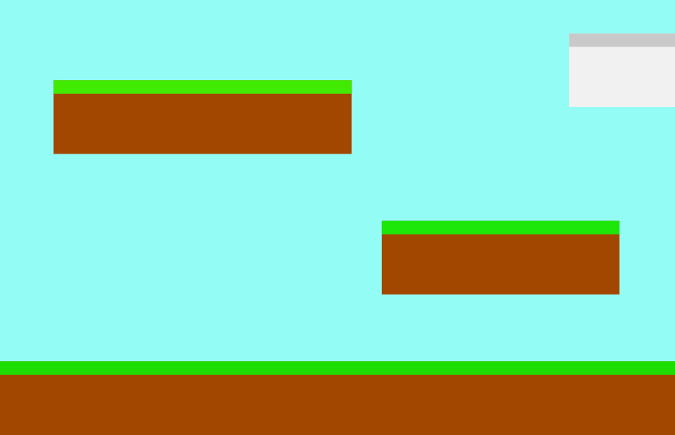 It also requires the width and height of the platform so Pygame knows how far the ground extends in each direction. The function uses your Platform class to generate an object onscreen, and then adds that object to the ground_list group. The platform function is essentially the same, except that there are more platforms to list. In this example, there are only two, but you can have as many as you like. After entering one platform, you must add it to the plat_list before listing another. If you don't add a platform to the group, then it won't appear in your game. Tip: It can be difficult to think of your game world with 0 at the top, since the opposite is what happens in the real world; when figuring out how tall you are, you don't measure yourself from the sky down, you measure yourself from your feet to the top of your head. If it's easier for you to build your game world from the "ground" up, it might help to express Y-axis values as negatives. For instance, you know that the bottom of your game world is the value of worldy. So worldy minus the height of the ground (97, in this example) is where your player is normally standing. If your character is 64 pixels tall, then the ground minus 128 is exactly twice as tall as your player. Effectively, a platform placed at 128 pixels is about two stories tall, relative to your player. A platform at -320 is three more stories. And so on. Tiled game worlds are considered easier to make because you just have to draw a few blocks upfront and can use them over and over to create every platform in the game. There are even sets of tiles for you to use on sites like OpenGameArt.org. The Platform class is the same as the one provided in the previous sections. The ground and platform in the Level class, however, must use loops to calculate how many blocks to use to create each platform. Now, regardless of the size of your window, Python divides the width of the game world by the width of the tile and creates an array listing each X value. This doesn't calculate the Y value, but that never changes on flat ground anyway. This is nearly the same code as the ground function for the block-style platformer, provided in a previous section above, aside from the while loop. For moving platforms, the principle is similar, but there are some tricks you can use to make your life easier. Rather than mapping every platform by pixels, you can define a platform by its starting pixel (its X value), the height from the ground (its Y value), and how many tiles to draw. That way, you don't have to worry about the width and height of every platform. The logic for this trick is a little more complex, so copy this code carefully. There is a while loop inside of another while loop because this function must look at all three values within each array entry to successfully construct a full platform. In this example, there are only three platforms defined as ploc.append statements, but your game probably needs more, so define as many as you need. Of course, some won't appear yet because they're far offscreen, but they'll come into view once you implement scrolling. Launch your game, and adjust the placement of your platforms as needed. Don't worry that you can't see the platforms that are spawned offscreen; you'll fix that soon. Our Pygame platformer so far. Wow amazing info,l love python,in your opinion how does it takes to be a skilled python programmer? 0. Practise. To do is to learn. To learn programming, start programming. Reinvent the wheel if you have to; some of my first programs were for silly things (bulk renaming of files, generating thumbnails of images, and so on) that I could have found elsewhere, but I chose to re-create for my own edification. 1. Open source. It's the answer: it lets you learn from the code of others, and to leverage stuff that other people have built (like Pygame or Arcade, and even Python itself). 2. Know how to parse text. It seems trivial, but at least 50% of programming boils down to knowing how to compare and manipulate text. 3. Fearlessness. Just jump in. Don't get intimidated by "better" programmers than you. In my spare time I've been reading, learning, implementing (repeat) a scrolling platform game and your article was a great read. I look forward to reading more from you. Making a game is truly satisfying and people like you that share the methods are doing great work. Thanks for sharing. My pleasure, Jason. I find that making games is a fun way to learn programming, and the concepts are surprisingly universal. While not everyone creating games in Python today is destined to get a job making video games, the idea of, for instance, abstracting a group of active items into a list that then gets updated each loop, is something that can be broadly applied to any programming exercise (and that's just one arbitrary example). Thanks for the article, Seth! I noticed that you have build your question with "how does it takes to…" and not "what does it takes to…"
One essential point, in my opinion, is to understand and use the ins and outs specific to Python. How create angle platforms like Sonic Hedgehog? SuperTux not have angle platforms.